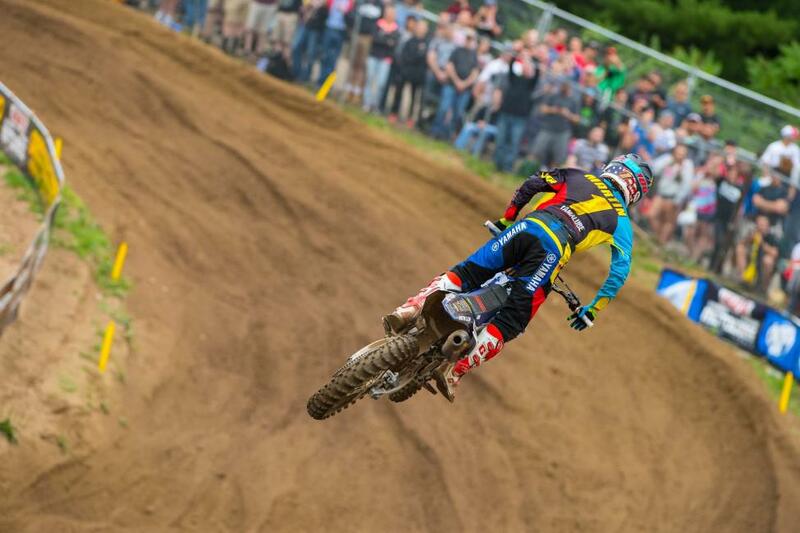 The Lucas Oil Pro Motocross Championship, sanctioned by AMA Pro Racing, made its highly anticipated return to The Wick 338 for the first time since 2013 on Saturday with the Red Bull Southwick National, the eighth round of the 2016 season. In the 450 Class, Monster Energy Kawasaki’s Eli Tomac became the third different overall winner this season, sweeping both motos en route to his first victory of the season. In the 250 Class, Yamalube/Star Racing Yamaha’s Cooper Webb extended his winning streak with his third straight overall victory, extending the championship points lead he took over one week ago. The opening 450 Class moto saw GEICO Honda’s Justin Bogle secure his third consecutive holeshot to lead the 40-rider field through the first corner, followed closely by Red Bull KTM’s Marvin Musquin and Rockstar Energy Factory Husqvarna Racing’s Christophe Pourcel. As Bogle opened a small gap at the front, championship leader and RCH Soaring Eagle/Jimmy John’s/ Suzuki Factory Racing rider Ken Roczen moved forward from a start just inside the top 10, quickly making passes to complete the opening lap in fourth. 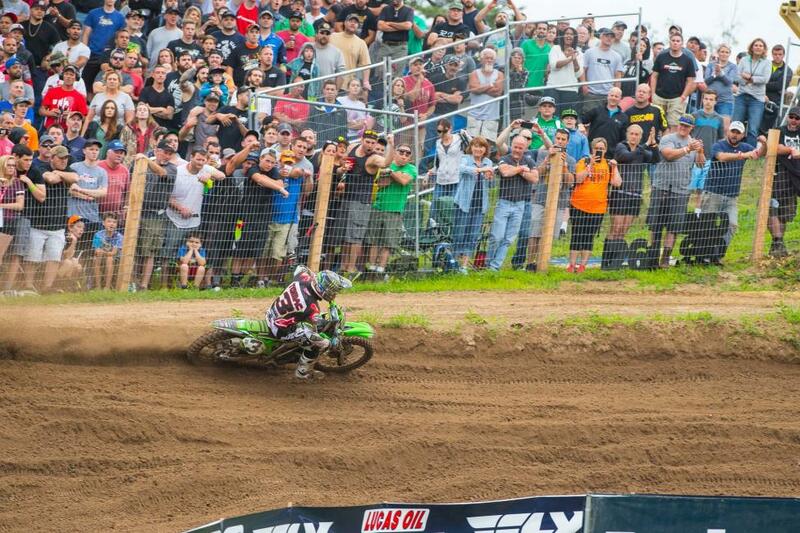 Tomac followed in hot pursuit in sixth place. Roczen battled his way past the French duo of Pourcel and Musquin to overtake the second position on Lap 1. However, Tomac was on a mission and refused to let the German out of his sights by matching his every move to slot into third. Roczen slowly chipped away at Bogle’s lead, but the Honda rider fended off his every move for several laps, allowing Tomac to inch closer. On Lap 5 Roczen and Tomac dropped the hammer and successfully found a way past Bogle, dropping him to third. The battle for the number-one position continued between the front runners as Tomac pushed his way around Roczen and into the lead with a spectacular pass on Lap 7. Once into the lead, Tomac logged the fastest laps of the moto to easily claim his first checkered flag of the season by more than 24 seconds over Roczen. Musquin rode strong to claim third, followed by Bogle and Pourcel in fourth and fifth, respectively. Tomac was dominant en route to his first win of 2016. For the second week in a row, Bogle swept the holeshots by once again putting himself out front to start the second moto, with Pourcel and Roczen in tow. The lead would be short lived for Bogle, who came together with Pourcel as they battled for first on the opening lap, going down in front of the entire field. Following the incident Roczen easily moved into second and wasted no time in setting after Pourcel to take the lead before the completion of the lap, with Tomac following into second. The championship’s top two riders immediately distanced themselves from the field and battled bar-to-bar with the biggest crowd in Southwick history cheering them on. As the fight for the lead continued, the battle for third began to heat up as well as Pourcel came under fire from Autotrader/Monster Energy/Yamaha’s Justin Barcia, who eventually made the pass stick on Lap 5. Tomac then made his attack on Roczen to take over the lead on Lap 6, but a quick tip over on the ensuing lap allowed the Suzuki rider to move back out front. Tomac remained unfazed and instantly remounted a challenge to regain control of the lead, just a few corners after the mistake that relinquished it. Tomac continued to lay down some of the quickest laps of the moto, but Roczen kept the gap relatively close and fought hard to stay within striking distance, ready to capitalize if Tomac was hit with more misfortune. Despite Roczen’s persistence, Tomac rode brilliantly to grab his fourth career win. It was his first since the second round of the 2015 season, more than one year ago, and his first with Monster Energy Kawasaki, giving the team its first victory since the final round of the 2013 season, 30 races ago. Roczen missed out on a moto win for the first time this season. 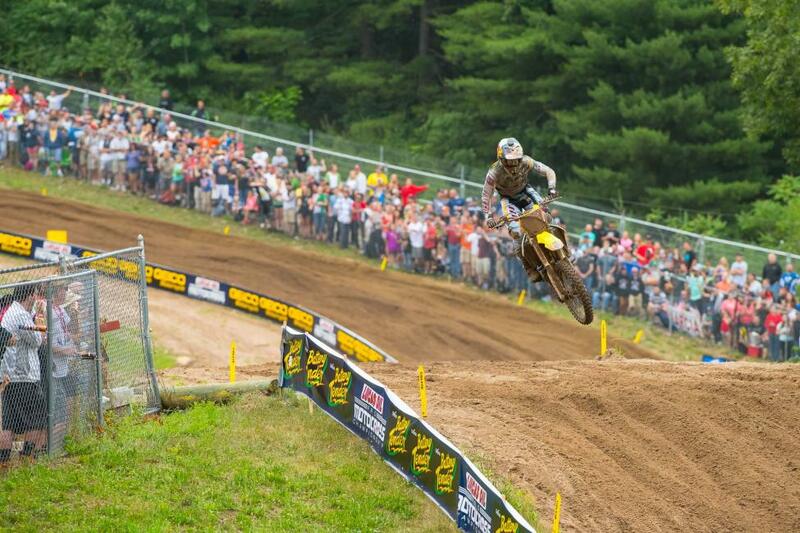 Roczen capped off back-to-back runner-up finishes by following Tomac across the line just over two seconds behind. It was the first time this season that Roczen failed to win a moto. Barcia’s third-place finish in the second moto came on the heels of an impressive come-from-behind effort in the first moto in which he caused a crash coming out of the first turn and was forced to resiliently battle back from a 24th-place start to finish sixth. His 6-3 results were enough to land him on the overall podium for the first time in 2016. Despite missing out on his sixth win of the season, Roczen continues to hold a comfortable lead in the 450 Class standings, which now sits at 47 points over Tomac. Musquin, who finished fourth overall (3-7), is third, 136 points out of the lead. Barcia made his first trip to the podium this season. Defending back-to-back 250 Class Champion Jeremy Martin led the field into the first turn of the opening 250 Class moto aboard his Yamalube/Star Racing Yamaha, followed closely by Troy Lee Designs/Red Bull/KTM’s Shane McElrath and his Yamalube/Star Racing Yamaha teammate Aaron Plessinger. In the opening stages of the race McElrath pulled alongside Martin and made an impressive pass to lead the opening lap. Behind the lead trio, Troy Lee Designs/Red Bull/KTM’s Mitchell Oldenburg and Monster Energy/Pro Circuit/Kawasaki’s Arnaud Tonus engaged in a heated battle to round out the top five. McElrath’s inspired ride at the front of the deeply talented field helped him open a comfortable gap over Martin, who was soon hounded by his teammate Plessinger. On Lap 2 Plessinger closed in on Martin’s rear fender and eventually made the pass to take over second, but just a couple laps later Martin retaliated on Lap 4 to regain the position. Martin then chipped away at the gap to McElrath, closing in on the KTM rider before making his way by and into the lead on Lap 5. Just behind them, the Swiss native Tonus was gaining steam and used a pair of aggressive passes on both Plessinger and McElrath to jump two spots into second on Lap 7. After starting the opening lap just inside the top 10, Webb patiently and methodically charged through the pack, eventually leading up to a pass on Plessinger for third on Lap 11. Just one lap later the Yamaha rider took full advantage of a mistake by Tonus to dive inside and take over the runner-up position. 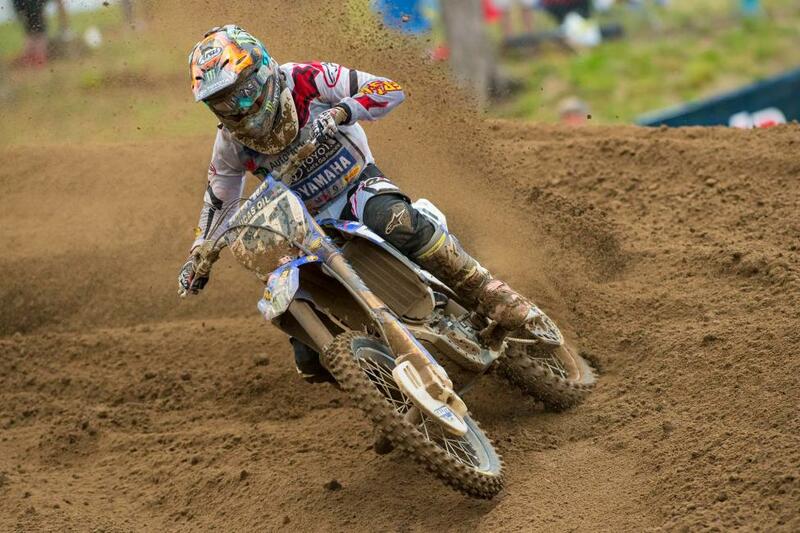 Martin relied on his championship experience to keep Webb at bay and claim his third moto win of the season. Tonus finished strong to capture his second ever podium result. Plessinger followed in fourth, with Monster Energy/Pro Circuit/Kawasaki rookie Austin Forker in fifth. Webb has won three in a row. In the second 250 Class moto Webb nailed the start to claim the holeshot, followed by McElrath and Rockstar Energy Husqvarna Factory Racing’s Martin Davalos. However, rookie Forkner made quick work to advance into second behind Webb. Martin concluded the opening lap in fifth. As the lead group settled in, Webb continued to lay down a torrid pace out front, soon giving himself breathing room over Forkner and McElrath. While running fourth on Lap 7, Martin crashed and dropped outside of the top 10, effectively ending his hopes of earning his first overall win of the season. That misfortune allowed the Monster Energy/Pro Circuit/Kawasaki duo of Joey Savatgy and Tonus to assume fourth and fifth, respectively. Tonus would make the pass to move into third and Savatgy, the former championship leader, would lose a couple more positions before a late crash relegated him to 11th. Webb and Forkner maintained their hold on the top two spots through to the finish, but McElrath was forced to deal with a late challenge from Yamalube/Star Racing Yamaha’s Alex Martin for third. On the final lap the duo was racing side by side when McElrath lost control of his KTM and crashed heavily, failing to finish. Martin then followed Webb and Forkner across the line in third. Webb capped off his third straight overall win with a wire-to-wire effort in the second moto, crossing the line more than 20 seconds ahead of Forkner. It’s the most wins for Webb in a single season. Jeremy Martin was second overall. Jeremy Martin recovered from his crash to finish fourth, which helped him secure the runner-up spot in the overall classification (1-4). Forkner’s career-best moto finish led him to the first overall podium result of his career in third (5-2). Webb’s sixth career win extended his lead in the championship standings to 37 points over Savatgy, who finished ninth overall (10-11). Savatgy sits just one point ahead of Jeremy Martin in third, who faces a 38-point deficit to Webb. 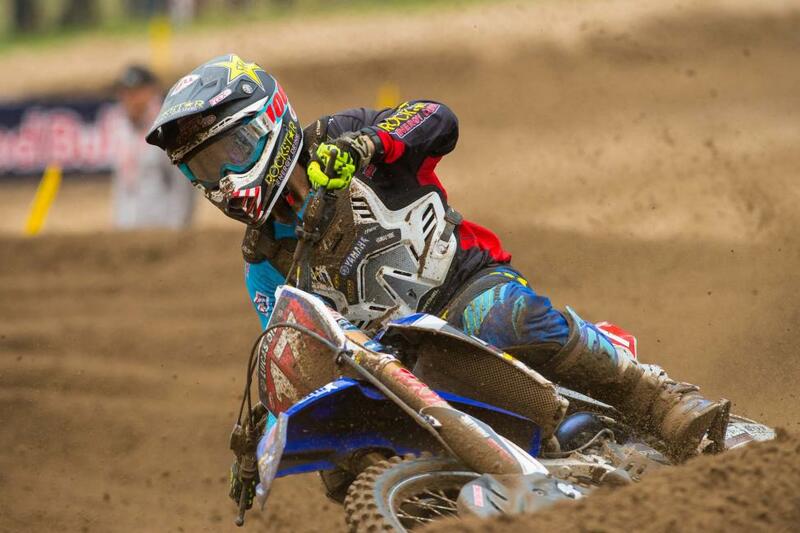 The Lucas Oil Pro Motocross Championship will continue next weekend for the eighth round of the 2016 season from Spring Creek MX Park in Millville, Minnesota. The La Crescent Wine & Spirit Spring Creek National will host the world’s most prestigious championship on Saturday, July 16. 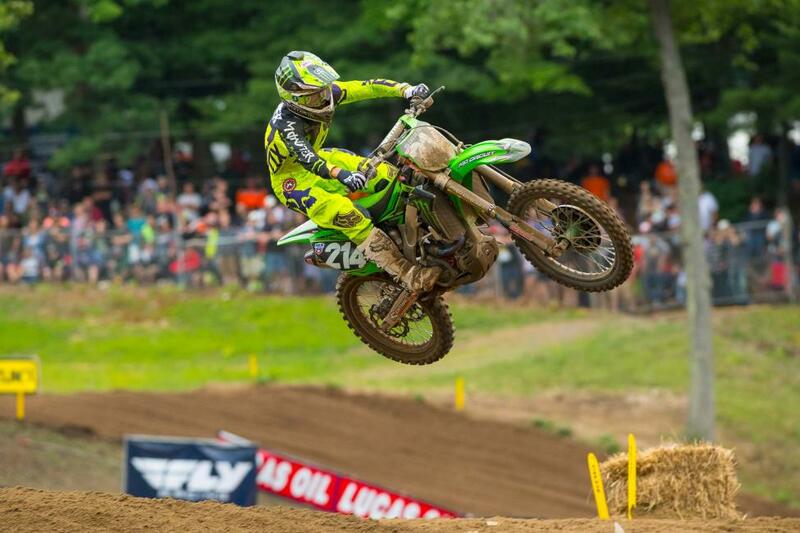 Rookie Forkner landed on the overall podium for the first time in third.